As one could guess, we learned a lot about distant reading and macroanlytic approaches to literary study, focusing on the technological pragmatics. 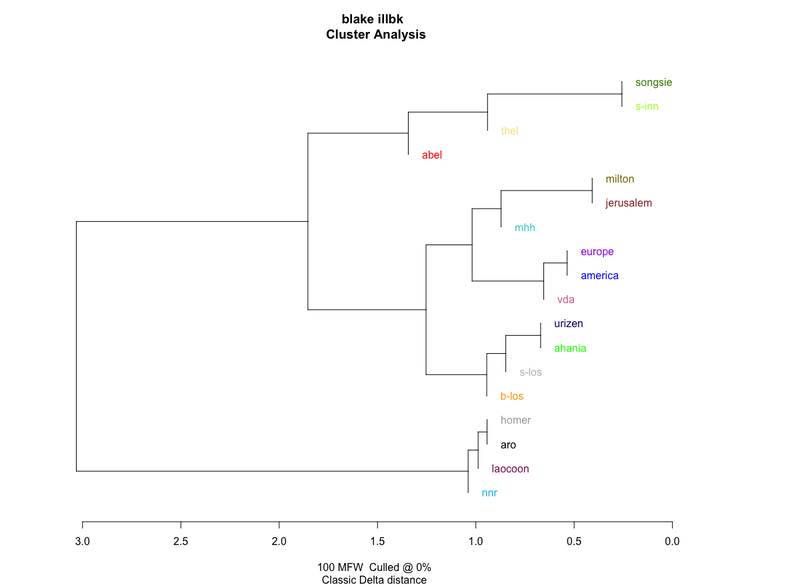 So: we messed around in RStudio, creating stylometric cluster dendrograms; we dumped huge corpuses into Voyant Tools; we experimented with an open source Topic Modeling app (and talked about how mathematically insane topic modeling is). On the left, one of those stylometric cluster dendrograms. 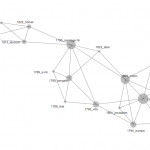 On the right, the same data dumped into a network visualization. What exactly are these visualizing? Well, each is essentially a comparative statistical analysis of Blake’s illuminated books, using the 100 most frequent words in the corpus. (Most frequent words, as a statistical sampling model, are an alarmingly reliable stylistic identifier. Feel free to make an argument as to why.) The absolute values or placement in the visualizations are meaningless for our purposes; the point is how each dataset (ill. book) relates to all the others. 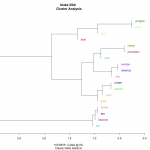 Datasets clustered together are considered more stylistically similar by the sampling algorithm. 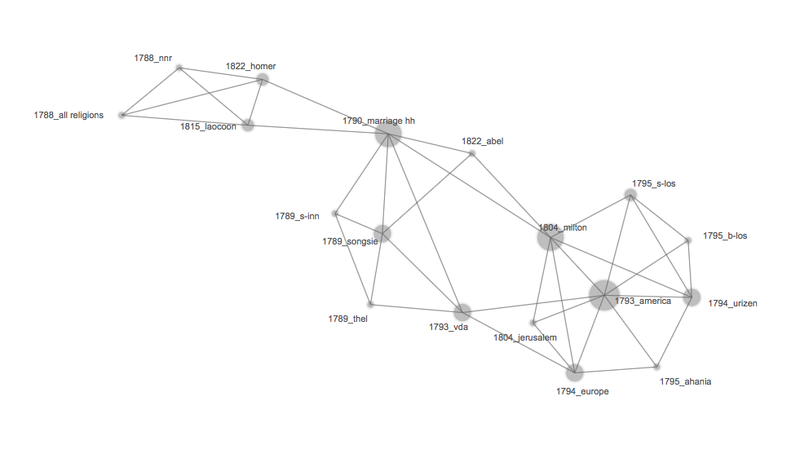 In the network visualization, you can better see “bridge texts” or central texts that seem to connect certain styles to others. OK, so what / who cares? But even if the results aren’t particularly viable, the process is frequently an enlightening experience: defamiliarizing texts and relationships forces one to reconsider–or at least recognize–basic assumptions about an author or era. As a final thought, while I think Blake isn’t a great candidate for text-based computational approaches, Blake seems ideal for image-based computational research. For example, what happens when we plug the Archive’s entire collection of digital images into a program like ImagePlot? That idea, and a few others, have been kicked around the Rochester group this summer. I hope we have something to share in the future. As an editorial project, our workflow tends to favor the ever-closer, ever-more-detailed account of Blake’s work. What happens when we step back and get a wider view?